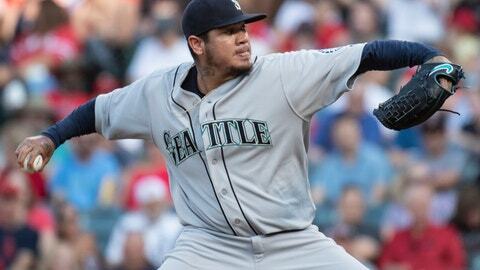 HOUSTON (AP) — Felix Hernandez vowed Saturday that his first-ever stint in Seattle’s bullpen won’t last long. For the longtime face of this franchise, it was difficult to digest the team’s decision to have him pitch in relief and he said it took him a couple of days to come to terms with it. Conversations with family and friends and encouragement from his wife Sandra, who he has been with since he was 14, helped. And that, Hernandez said, is exactly what he plans to do. Though the 2010 AL Cy Young Award winner sees this only as a temporary setback, he’s prepared to embrace his new role for the good of a team that’s in contention to reach the playoffs for the first time since 2001. “I’m just part of the team and I’m going to do whatever’s possible to help the team,” he said. The 32-year-old Hernandez is 8-10 with a 5.73 ERA in 23 starts for a Mariners team chasing a playoff spot. Hernandez, who has the fourth-most starts in MLB history without a relief appearance, has spent two games in the bullpen, but has yet to appear in a game. He shared his first impressions of the experience. “It’s boring. I’m telling you,” he said with a laugh. Both nights he’s trotted with closer Edwin Diaz to the bullpen in left-center field at Minute Maid Park, where the Mariners are playing the AL West-leading Astros. Hernandez said he’s picked his brain about relieving, but he’s far from the only one he’s reached out to for advice on the move. Hernandez pointed out that he’s appeared in the All-Star game several times out of the bullpen, but admitted that he “might need some time” to get warmed up to enter a game. He said the team didn’t tell him anything specific that they need to see from him for him to get his starting job back, but he knows that he’ll have to improve his fastball command to turn things around. Hernandez said he believes the problem is mechanical and said he’s trying several different things to try and get back on track. When facing reporters following his recent tough starts, including his last one against Texas in which he allowed a career-high 11 runs — seven of them earned — he seemed discouraged and a bit down. It was a different Hernandez who spoke on Saturday. It wasn’t quite the King Felix who threw a perfect game in 2012 and led the AL in ERA in both 2010 and 2014. But there were unmistakable notes of the swagger and bravado that were hallmarks of the presence he had on the mound when he was one of the game’s most dominant pitchers. He smiled easily and cracked jokes, his glossy ringlets bouncing around as he laughed. He said instead of getting mad about the move or letting it hurt his feelings, he’s using it as motivation. “All it does is encourage me to get back,” he said before flashing one last smile.